The percentage of overweight children in the United States is growing at an alarming rate, with one out of three kids now considered overweight or obese. Many are spending less time exercising and more time in front of the TV, computer or video-game console. 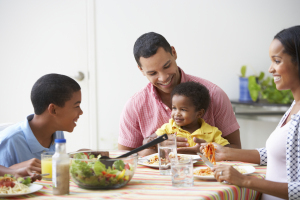 In addition, today’s busy families have less time to prepare nutritious, home-cooked meals. From fast food to electronics, quick and easy is the reality for many people. Living Well has partnered with the Professional Medical Center to address various medical issues that impact our community. This month we chat with Arti Subramanian, MD, about childhood obesity and how families can prevent or escape unhealthy lifestyles and habits. Dr. Subramanian is board certified in internal medicine and pediatrics. She completed her residency at MetroHealth Medical Center in Cleveland and has been practicing at Professional Medical Center in Detroit since December 2013. Her clinical interests lie in the prevention and care of illness, patient education and in the implementation of electronic medical record systems to improve patient care. Living Well: We have young children today facing serious adult health problems. How did this situation develop? Dr. Subramanian: Good health is a result of the confluence of various factors – healthy diet, healthy habits, good mental health and an educated populace. In our current state of all these being threatened by lack of financial resources, reliable information and the various limitations of lifestyle, it leads to complications. This is especially crucial in socioeconomically disadvantaged populations that have less healthy diets and higher disease risk compared to more privileged socioeconomic groups. Cost is a huge barrier to overcome in the adoption of a healthy diet, whether that cost is financial or in regards to time spent preparing the food, and it is hard to find a balance. Misinformation regarding health issues is rampant and we need education to combat it. We need better nutrition in school. All of this is straining an underfunded and stressed system to its limits already. There simply aren’t enough resources for us to reach the people that need our efforts the most. Children remain the hidden victims of poverty and hunger, and rarely have we made the effort to change the education we provide them about their bodies, their health, and how to make better choices. Living Well: Can you give an example of the tragedy caused by childhood obesity? Dr. Subramanian: Does seeing a 28 year old diagnosed with diabetes count as a tragedy? Does a 30-something young man requiring bariatric or weight loss surgery constitute a tragedy? I see several young people in my practice on medications for high blood pressure or cholesterol for a multitude of reasons, but one thing they all have in common is they are obese. I have teenagers who are contemplating suicide because high school is hard anyway, but getting teased or left behind constantly is a hard pill to swallow, and the slow speed of weight loss once they make lifestyle changes is discouraging to them. Girls are starting their menses at younger and younger ages, we’re diagnosing heart disease at younger and younger ages, heart attacks are more frequent in age groups that are considered low risk but their weight and lifestyle place them at higher risk. There are obese teenagers in my practice that already have “adult” health issues like sleep apnea, fatty liver, glucose intolerance. If that isn’t a wake-up call, I don’t know what else we need to wait for. Living Well: Can you describe the “perfect storm” health crisis facing America? Dr. Subramanian: The current obesity crisis is due to complex interactions between genetics, dietary intake, physical fitness and activity, environment and psychosocial/socioeconomic factors. It’s not a relationship that is as well-defined as we need it to be. But while genes and psychosocial conditions are harder to change, diet and physical fitness are factors that are entirely in our capacity to modify. We live in a world where there is advertising targeted specifically to make high-calorie foods attractive as compared to healthier foods. They are marketed as healthier alternatives with wording that is misleading but not easy to see through. Fifty percent sugar does not mean sugar-free; no trans fat does not mean fat-free, etc. There are studies that show healthier eating habits cost more money for a family. This makes it harder for families living on a fixed income to justify spending more money on food that does not seem as delicious as the processed versions. For instance, one of my patients who has the traditional triad of diabetes, high blood pressure and heart disease continues to consume fast food regularly because it is cheaper for her to buy a bucket of fried chicken and a large drink with unlimited refills because it feeds all the five people in her family and no one goes to bed hungry for less than seven to eight dollars. If she were to use that money to buy salad ingredients and dressing and maybe a whole chicken, it wouldn’t stretch that far. How do I tell her to not feed her family? This isn’t as easy as it looks, honestly, neither for patients or healthcare providers. Living Well: Is there anything we can do to eliminate the obesity threat? Dr. Subramanian: We need a solid plan with buy-in from all involved parties — politicians, school, families, healthcare providers, insurance companies, etc. We need to make good health fashionable again. Create safe outdoor places for children and families to spend time exercising, walking and playing. Meal plans in schools need to be reevaluated to be nutritive rather than caloric. Subsidize fruits and vegetables, seasonally may be, to provider better access to healthier foods. In an ideal world, fast food would not be advertised targeted to children. Encourage families to grow their own veggies and fruits to combat cost; there are studies that show children consume vegetables that they grow more enthusiastically than the ones bought from the store. End food deserts — areas without grocery stores and served only by convenience stores — is essential. Most food deserts are located in areas with socioeconomic limitations, making it difficult for our most at-risk populations to access healthy foods. Portion control is another issue that is pervasive — excessively large portions that are normalized to us now. There needs to be better oversight of serving sizes in the fast food and restaurant industry for both for children and adults. Living Well: Should parents be concerned about the obesity epidemic even if their child is not obese? Dr. Subramanian: Absolutely. Healthy habits last a lifetime. A lot of adults become obese even if they were not obese children because they lack healthy foundations — exercise, healthy foods and portion control. We must teach our children to stay healthy, teach them about their bodies, and how these bodies work — not to glorify weight loss or skinniness, but more to make good physical and mental health and fitness a normal and desirable thing. Good health is not a me vs. them thing, it remains a collective goal and a collective effort from everyone is required. Living Well: Is there a link between television time and childhood obesity? Dr. Subramanian: The less time a child spends moving physically and the more time they spend in front of the TV, the greater their risk of becoming obese. Using the TV as a babysitter is a dangerous trend. Use the TV instead to get kids moving. Get fitness videos and move along to them as a family. Use the commercial breaks in programming to get off the couch and clean for the duration of the break. Dance. Get some Hula Hoops and have fun. The AAP recommends no more than two hours of screen time for children in a day. Depending on how much time kids spend with computers for schoolwork, I would say we should cut that down to an hour, and use the rest of the time to get them out of the house and playing instead. Living Well: Why is it important for families to get fit together? Dr. Subramanian: Anything is more fun when done as a group. Singling out a child is hard on the child, especially if they have self-esteem issues from being teased at school. It shows the child they are loved and accepted as they are, that their family is a place they will find unconditional support. Good habits must be a family routine to normalize them. If fitness becomes a part of a family’s culture, it makes sustained long-term improvements to the health of that family. Living Well: Is it important for families to eat together? Family meals are more than feeding events. It is often the only time of day for the entire family to connect, create their own traditions and habits, provide opportunities for conversations and non-verbal learning cues. Children get an opportunity to learn teamwork, cooperation and of course, meal preparation — all valuable “real-life” skills. Living Well: Should children be put on diets? Dr. Subramanian: This is an interesting question. “Going on a diet” is an idea that conjures images of food deprivation. I think we need to change that. A diet is a collection of food items consumed regularly to provide nutrients and not to deprive one of the same, and definitely not a restrictive list of foods. Dieting is restrictive and harmful to the normal growth and development of a child’s brain. Children should be encouraged to explore different foods and eat healthy, fresh, balanced meals three times a day with the occasional treat or dessert. Living Well: Where should parents start to reduce the threat of childhood obesity? Stop using food as motivation for children; use other non-food things like trips to the park, craft supplies, etc. Decrease the consumption of processed foods and eat more veggies and fruits. Children learn from watching their parents, so parents should model good habits. To read more of the interview with Dr. Subramanian and to see her recommendations on how busy families can eat better, visit www.michronicle.com . Continue the conversation on twitter @michronicle or Like or Michigan Chronicle page on Facebook. We come to know about childhood obesity that is existing now a days. Overweight of children is not good for them. So, people must care their children. Main cause of overweight is some habits which people have. So, people should change their habits to reduce weight.